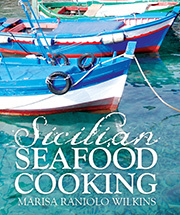 Where would Sicilian food be without fish? Sicily is an island, and a Catholic one at that, where the people were obliged to fast and abstain — refrain from eating meat — on certain days, mainly Lent and on Fridays.Catholics are no longer required not to eat meat on Fridays but Sicilians eat a lot of fish. One very popular fish is the sardine, still relatively cheap in Sicily and easily available. The photograph was taken in the Palermo market in December 2008. At that time 4 euros were about $8.00 Australian. For example you cannot go to Sicily and not eat Pasta con le sarde. There are many regional variations of this sauce, often called by the same name, but the most famous is from Palermo made with wild fennel, pine nuts, saffron and currants. Sardines are perfect on a BBQ, and baked, but Sicilians also like them crude (raw) e conzate (and dressed), crude e condite in Italian. Although they are called raw, they are cooked by the lemon juice in the marinade. 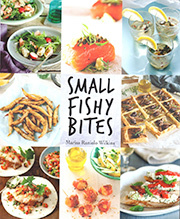 Sardines are sustainable, and a good choice if you are concerned about the environment. Marinaded sardines make a great antipasto and lose that strong fishy taste that those people-who-do-not- like sardines hate. When I first came to Australia we were unable to buy sardines, now they have become very popular (similar to squid, both were used for bait!). The sardines must be fresh, freshly cleaned and filleted with no head, central spine or innards. Begin your preparations one day ahead. parsley and fresh oregano, ¾ cup, cut finely. Arrange the fish in one layer on a plate or wide vessel and pour the juice of the lemons on top (this lemon juice will be discarded). Seal with plastic wrap and refrigerate for 3-6 hours. They are ready when they have turned almost white. Drain the juice well. I use a colander and then quickly dry the fish on a paper towel. Arrange the fillets in a single layer on a large plate. Sprinkle the fish with herbs, garlic and salt and pepper. Dress with the extra virgin olive oil, cover with plastic wrap and refrigerate again for about an hour until ready to serve. I do like mussels (called cozzuli in Sicilian and cozze in Italian) and they are sustainable, but more often than not I cook too many (usually steamed in a little white wine, garlic, parsley, chili and eaten with bread). What to do with left over mussel meat? This is not ever a problem, but for something different try these. Crostini (from the Latin, crusta – crust) are thin slices of toasted bread, cut small, brushed with olive oil and then toasted. Crostini are eaten like canapés spread with different toppings (usually chicken livers) and served with drinks. But these Sicilian crostini are different and remind me of French toast. In this recipe, the mussel shells are discarded; the mussel meat is made into a paste and is then sandwiched between two small slices of bread. It is then dipped in beaten egg, and fried. They make wonderful morsels. Perhaps there is some French influence in this recipe because it contains besciamella. Some Italian culinary historians believe it was brought to France by the Italian cooks of Marie de Medici but the most common story is that the court chef named the sauce after an important steward in Louis fourteenth’s court – Louis de Béchameil. Originally béchamel was made by adding cream to a thickened stock but the more common and more modern version is made by adding hot milk to a roux of butter and flour. Some béchamel also contains the vegetables found in stock. tomato salsa, 1 cup (made with 500g of tomatoes, 2 garlic cloves, fresh basil leaves, sea salt, ¼ cup of extra virgin olive oil). Place all of the ingredients and any liquid from the mussels in a saucepan and cook uncovered until reduced to about 1 cup. Use cool. 1 tablespoons butter, 1 tablespoons flour, 1 cup milk, freshly ground nutmeg, salt and freshly ground pepper to taste. Melt the butter and add the flour in a saucepan over a moderate heat, cook the mixture while stirring with a wooden spoon for 1-2 minutes. Over the heat gradually add the milk while stirring to stop lumps occurring. When all the milk is added continue to cook while stirring until the mixture thickens (it should be quite thick). Season, add nutmeg, remove the pan and allow to cool. Mix the salsa, besciamella, ground pepper, mussel meat and cheese. Cut the bread to size and thickness about 1cm. Spread this mixture thickly between slices of bread, like when making sandwiches. Dip the sandwiches briefly in the egg but allow the egg to soak in. Heat the extra virgin olive oil in a frying pan and fry the sandwiches on each side. Serve hot. Chine va chjanu, va sanu e va luntanu (Sicilian proverb). Chi va piano, va sano e va lontano. (Le cose fatte con calma sono le migliori). The best things are made when calm. I have shopped at the Queen Victoria Market ever since I moved to Melbourne from Adelaide. I am always excited by new produce, whether it is new in season or because it is new to me. I saw the vlita at one of the stalls where I often buy my vegetables. I had never seen vlita before – sold as a very large bunch of a long, green leafy plant with its roots still attached. Greens leafy vegetables in January are not very common. One of the stall owners is a Calabrese (from the region of Calabria in Southern Italy) so I assumed – incorrectly – that it was a wild green, traditionally eaten like spinach in Italy and one I was not familiar with. As I continued my way down the aisle, the vlita was attracting a lot of attention, but from people of Greek heritage, not Italians. I was stopped four times and they were surprised to hear that I knew the name and that I intended to sauté it in olive oil with garlic. A couple of them mentioned the word horta. Further down the aisle, I was stopped by yet another woman who told me these plants were much appreciated in her country – India. She said that she was more familiar with a purple tinged variety. So home I went with my various bits of information, determined to discover more. Yes, vlita is a common weed in Australia, but it is a wild green and one of many gathered and eaten in other parts of the world including Greece, Japan, India, South America and Taiwan. The taste is a little like a beet or spinach, only more grassy. Vlita belongs to the amaranth family and this variety is known as palmer amarynth. The amaranthus tricolor or red amaranth is sold more in commercial quantities than the green variety and is a very attractive plant; the leaves are much more colourful than palmer amaranth and it is sold in many stalls which sell Asian vegetables. Alternative names are een choi (Chinese) phak khom suan (Thai) radên (Vietnamese) bayam (Indonesian). In different parts of Greece, it is usually served as a cooked green salad. Horta are leafy green vegetables or wild greens and vlita is one of these. Some varieties of the plant are grown as a grain crop for their seeds – which are very nutritious and can be made into flour – and amaranth flour is becoming increasingly well known as a nutritious alternative to wheat, especially in America. The young leaves and tender stalks are picked and eaten before the plant flowers. They were sold to me in large bunches with the roots attached – picked this way, they last longer. Wild greens are called erbe spontanie in Italian (spontaneous herbs) and Sicilians are very fond of them. They forage for them and can also buy them at the market. Weeds, like vegetables are seasonal and collected by many people. Some of these wild greens are also sold in markets. Gira (or giriteddi), sparaceddi (wild asparagus) or amareddi are particularly popular. Last October–December), when I was in Sicily there were lassine, sanapu, agghiti (wild spinach), urrania (borage) and wild fennel. Wild greens/ Edible weeds can be cooked alone or mixed with other green leaf vegetables. See TORTA DI VERDURA (A vegetable flan or pie). Italians cook greens, as the Greeks do: blanched/ whilted and drained, then seasoned with salt, olive oil and lemon juice and presented hot or cold as a cooked salad. My favourite cooking method (common mostly in the South of Italy) is to precook the greens in boiling, salted water, drain them well and then sauté them in olive oil, chilli and garlic. They can be eaten hot or cold.